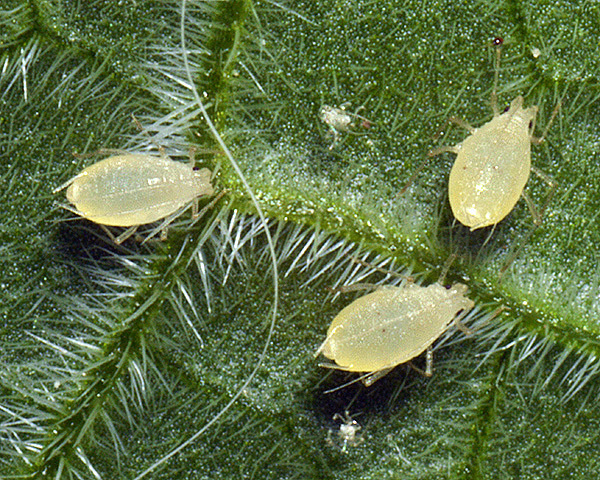 Ovatomyzus are a genus of very small fragile pale aphids, the adult viviparae of which may be winged or wingless. The characteristics of the genus are intermediate between Ovatus and Myzus. Ovatomyzus apterae have well developed antennal tubercles with slightly diverging inner margins. The antennae are as long as the body, or longer, with a very long terminal process. The siphunculi are long, slender, cylindrical or slightly swollen. The cauda is tongue shaped, slightly constricted near the base. There are 3 species worldwide. Ovatomyzus have lost the sexual stage in their life cycle, and feed all year round on plants in the Lamiaceae and Boraginaceae. Apterae of Ovatomyzus boraginacearum are usually whitish to pale greenish yellow, but may be brownish yellow to orange in overwintering populations. Their antennal tubercles are smooth and well developed. The pale antennae are longer than the body, and the terminal process of antennal segment 6 is 1.5-2.3 times the length of antennal segment 3. The pale siphunculi do not have any distinct subapical polygonal reticulation, and are slightly swollen subapically, narrowing to a slight constriction before the flange. 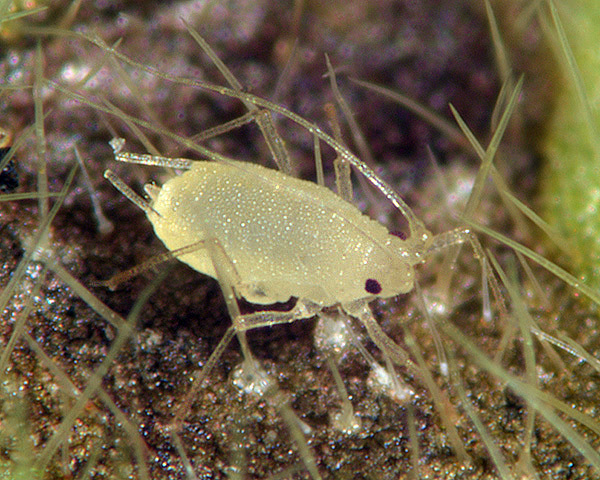 Ovatomyzus boraginacearum is a very small aphid, with a body length of only 0.9-1.6 mm. The Ovatomyzus boraginacearum alate (not pictured) has a black dorsal abdominal patch and cross bars on the posterior tergites. The antennae and legs of the alate are dark, the siphunculi and cauda are dusky. The alkanet aphid lives scattered on the undersides of leaves of its host plants, which are mainly in the family Boraginaceae, especially alkanet (Pentaglottis), lungwort (Pulmonaria officinalis) and comfrey (Symphytum officinale), and less commonly in the family Dipsacaceae. Ovatomyzus boraginacearum does not have sexual forms, but is reported to have a specialized hibernating apterous morph. It has been found in several European countries including England, Germany and Netherlands, as well as in Iran.